The handsome guard in his navy uniform immediately approached me. I mustered one of the few Italian phrases I know, “Mi scusi.” He stared at me. I fumbled. “I, I , the crowds. I can’t stand the crowds.” His eyes softened. “Can I stand here for just a moment?” He nodded and walked the other way. I waited until there was a break in the tour groups and started walking again. It was still crowded, but I wasn’t being constantly jostled. I wasn’t prepared for the opulence of the Vatican Museum. Room after room of beautifully painted walls and ceilings. Halfway through the visit, my neck hurt from staring at the ceiling so much. 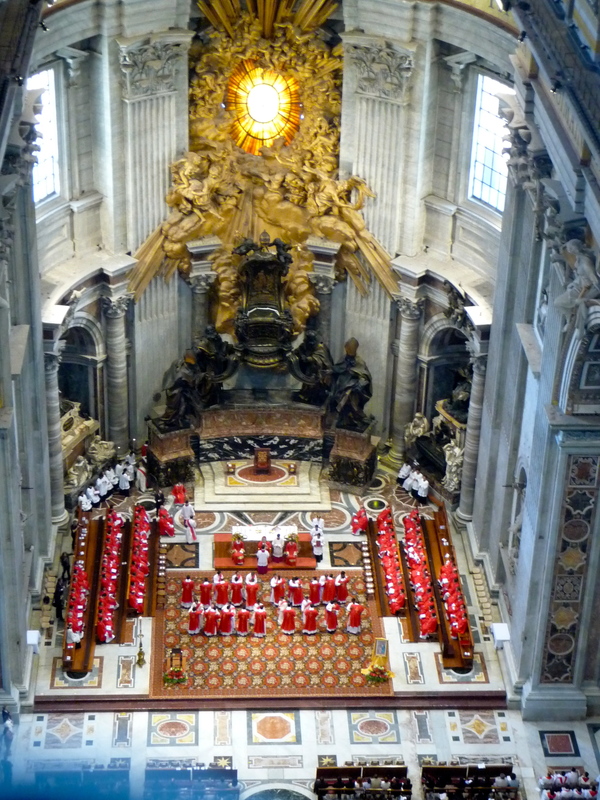 On the one hand, I was disgusted by the wealth the church had accumulated. On the other had, what works of art. What incredible masterpieces had been created in the name of faith. 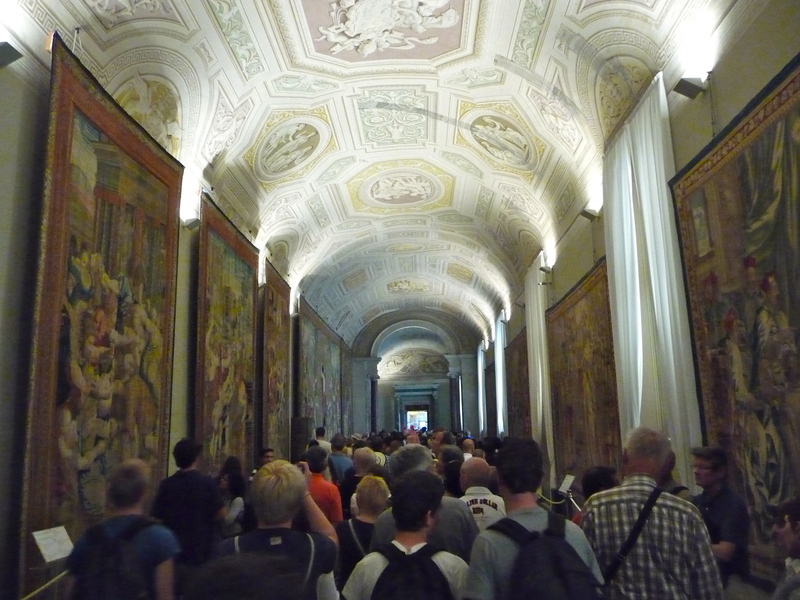 The culmination of the tour was the Sistine Chapel. 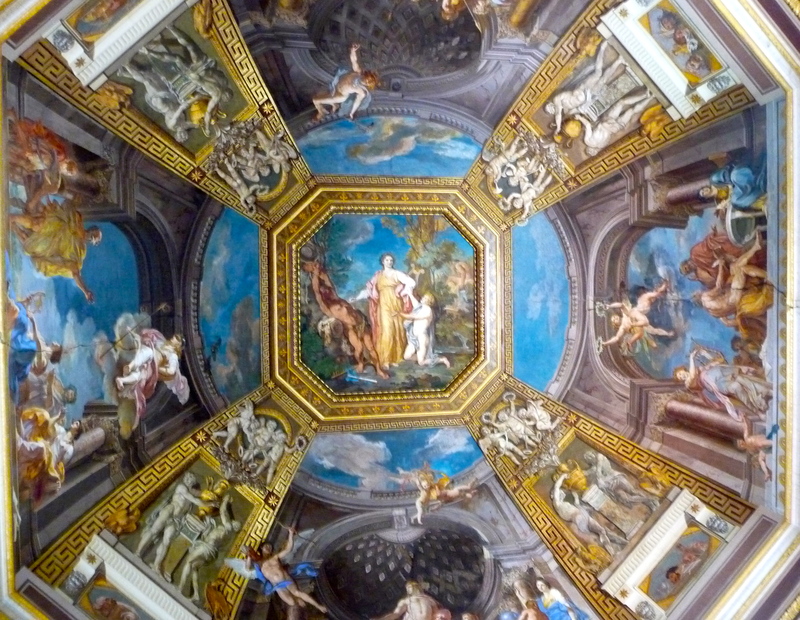 For some reason, I had always believed the Sistine Chapel was a dome. I was somewhat taken aback when I entered the long rectangular chapel. Every bit of the ceiling and walls were painted. I listened to my audio guide describe each panel of the ceiling and walls. I marveled at the detail of the paintings. All the while the guards yelling, “Silenzio! Silence!” The room would hush, then gradually sounds would arise, from tour leaders sharing expertise, from friends whispering to each other, from couples marveling at the art. 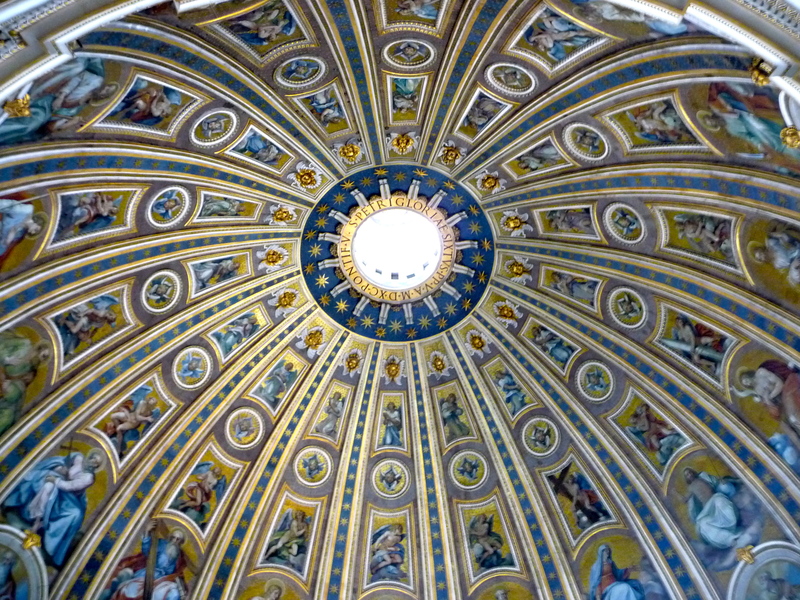 I was pushed out of the Sistine Chapel amidst a tour group, which was great, because it landed me directly at the entrance of St Peter’s Basilica. I walked in and stopped. 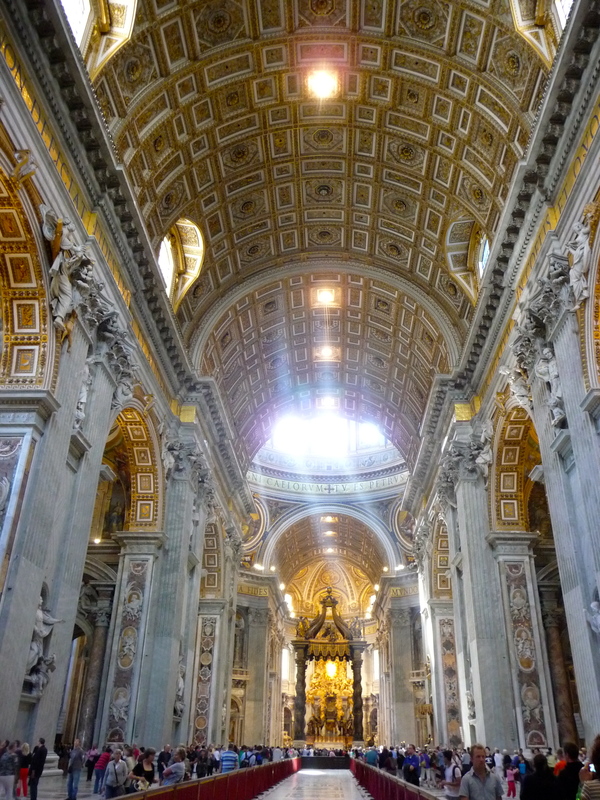 As impressive as the Sistine Chapel was, I was unprepared for the grandeur and beauty of St Peter’s. I stood at the entrance, mouth agape. Sun shone through the high windows, the type of sun I used to always refer to as “Jesus rays” when I was younger. The rays of sun that appear so frequently in portraits of Christ, reigning down on the blessed. 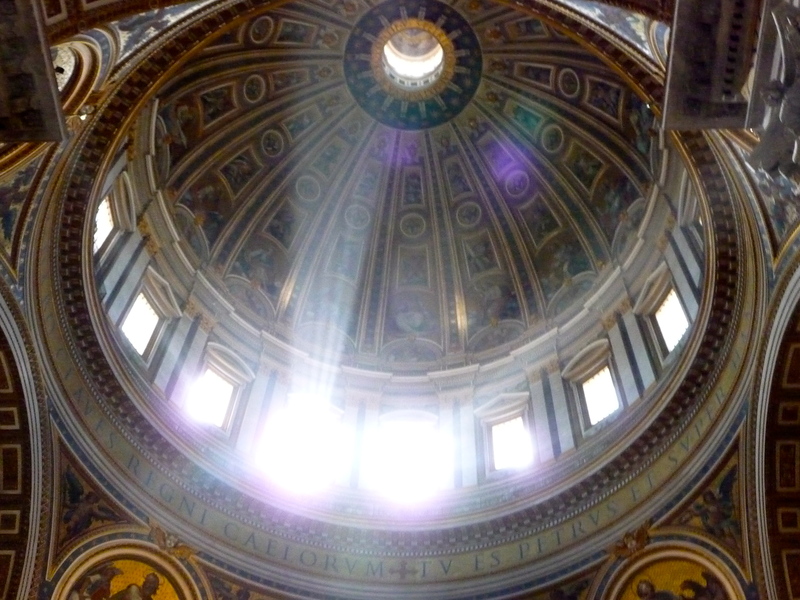 The first set of stairs (about 250) led us to the lower part of the cupola, to the base of Michelangelo’s dome. It was quiet, the only sounds coming from the priest and choir performing Mass hundreds of yards below. The sweet smell of incense rose to greet us. I was transfixed. I stood for half an hour, watching the Mass below take place, occasionally looking upwards at the marvel of Michelangelo’s work. We were surrounded by incredible mosaics. It was almost sensory overload. Everywhere I looked, there was incredible beauty. I made my way towards the stairway. The remaining climb to the top was tedious. Over 300 more stairs, the stairway growing more and more narrow the closer to the top we got. We were all in a single file line, trudging up the stairs. A few floors away from the top, the line suddenly stopped. I heard sobbing. A woman a few people in front of me was claustrophobic and having a panic attack. Her boyfriend turned around and apologized, not quite sure what to do. We waited, then she continued, still sobbing. “You can do it,” I thought. “We’re almost there. Hang in there.” We stopped again, waiting for her panic to recede. I wanted to give her a hug, to reassure her to take her time. We waited, then continued. We finally made it to the top. What joy! What expansive views of Rome! 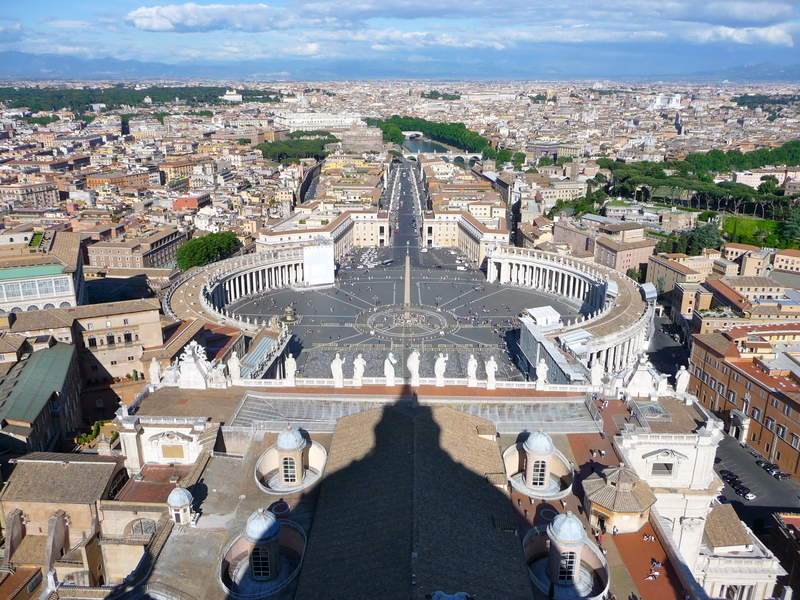 After walking around, and around, and around the top of the dome, I headed back down, to St Peter’s square. I stood below the balcony where the Pope addresses the crowds. I imagined what it must be like to stand here, waiting for either black or white smoke to arise from the chapel of the Sistine Chapel. I watched the sun set behind St Peter’s before beginning the walk home, exhausted from the overabundance of beauty I had witnessed. 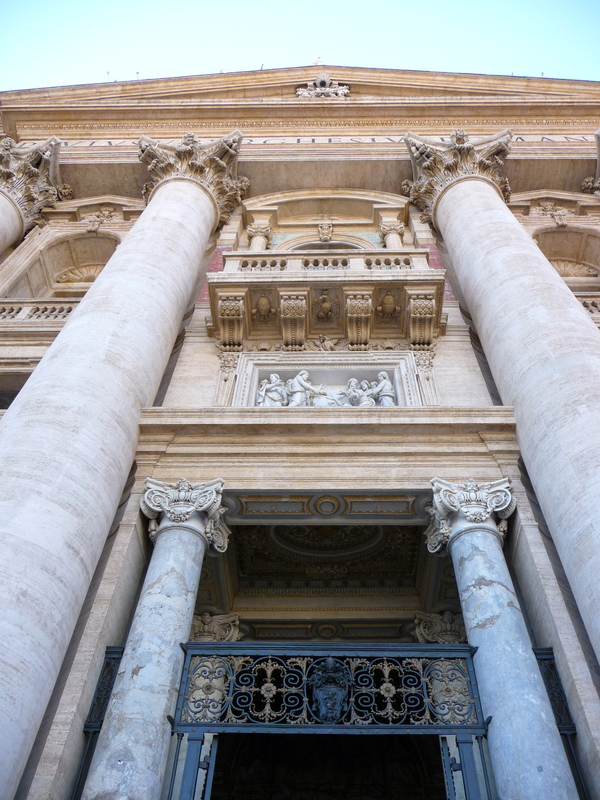 Looking up at the Pope’s balcony. I kept hoping he would peek from behind the curtains. Lovely! Such beautiful pictures, Lori! Enjoy! Loving your post and photos – thanks for sharing! I like how you got the shadow of the dome to line up exactly with the obelisk. Neat trick. Thanks, Brad!I was up there in the late afternoon and the shadows were beautiful. 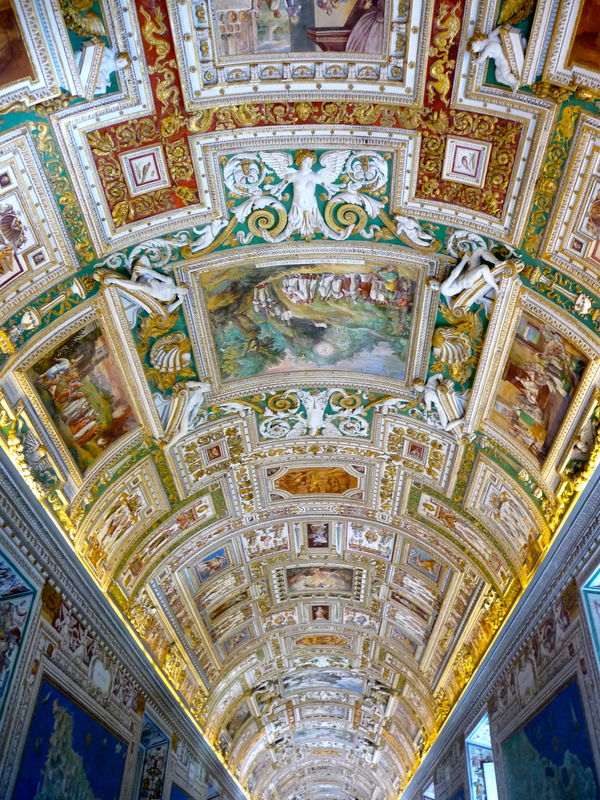 I’ve heard the Vatican is a zoo, but I’d absolutely love to see those ceiling paintings for myself. There is so much in Europe I have yet to visit ~ I’m missing lots of the main countries! Just catching up on your Italy blog posts today. Love this narrative of your Vatican tour! Brings back lots of great memories.